One of the simplest and most affordable ways to create a sophisticated dining space is to breathe new life in to it with a fresh coat of paint. A dining room is designed to set the stage for special occasions such as family get-togethers, birthdays and Christmas celebrations and is important that you consider its different purposes when opting for the perfect shade. For understated elegance, neutral shades like our Glimmerous paint work well, especially if you are opting for a contemporary aesthetic. Our Eternal paint, with a dark green hue will add a splash of personality to the room, complementing the intimate space well. White shades like our Tranquillity paint can really help to open up a compact dining room when space is scarce, and is an easy and adaptable option. Simplicity isn’t the only way to create an elegant dining room. Decorating with wallpaper allows you to add colour, texture and personality to the room, and opting for a sophisticated print will only emphasise this look. Neutral tones don’t have to be boring either. 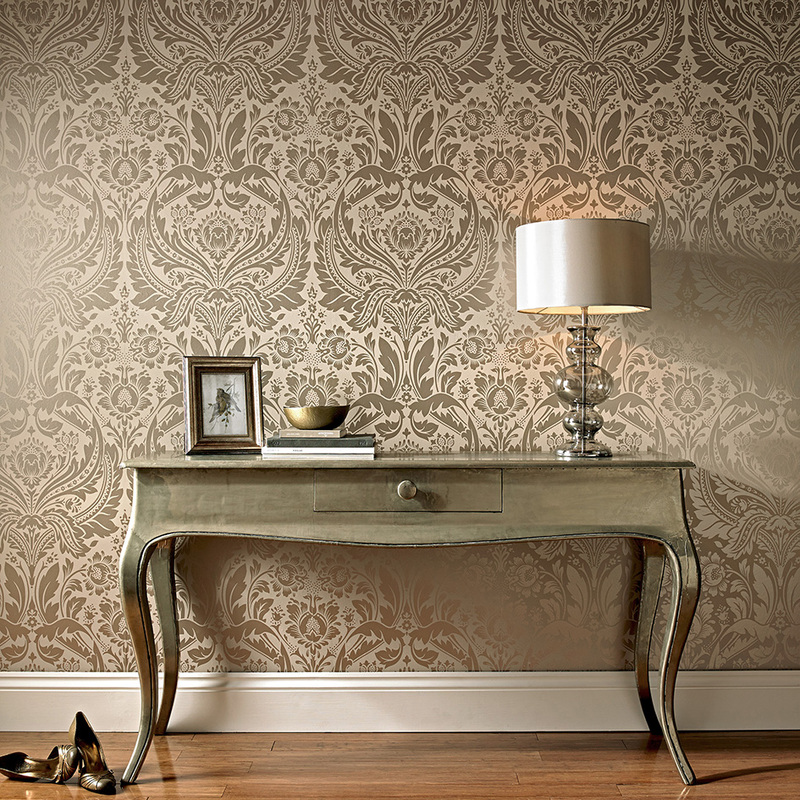 Our Desire wallpaper features a damask design with a shimmering metallic finish. The Aurora Chocolate damask design is ideal should you wish to add a little warmth to a spacious dining area. If you think a bold design will overpower your room, why not opt for a feature wall? This way you can create a unique design by pairing it with a versatile neutral shade such as our Flawless paint. Damask designs with mica undertones and shimmering glitter finishes can’t fail to wow your guests. For an ultra-sophisticated dining area the smallest details are of great importance. A few well-chosen accessories can transform the room entirely, and can help transform the space from ordinary to extraordinary in a flash. 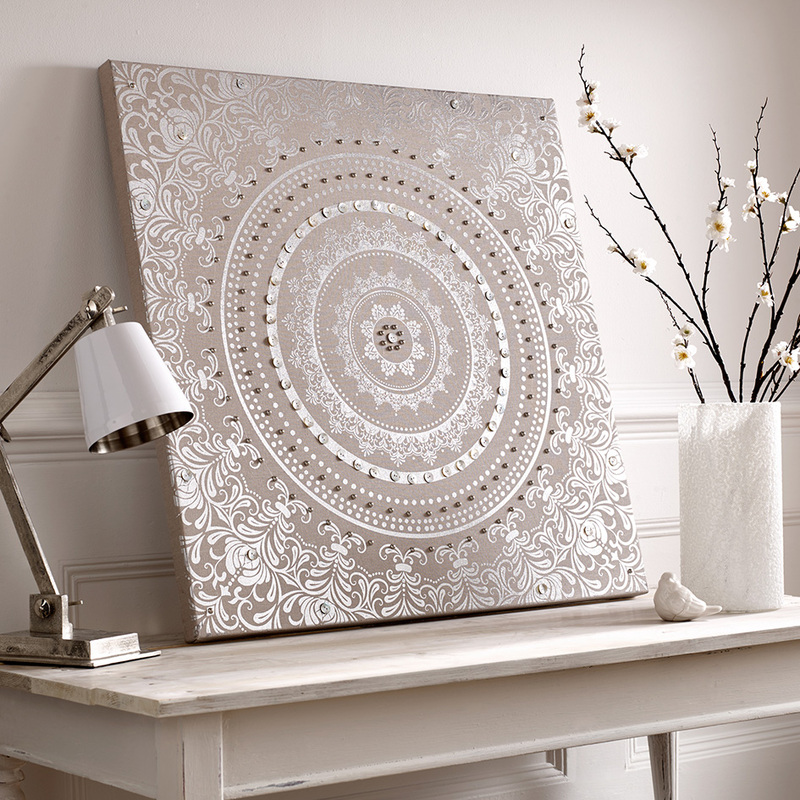 One of the easiest ways to inject a touch of elegance into the room is with our exquisite wall art. If you have kept it simple with neutral paint colours, you can afford to add a few prints and patterns to complement the décor. This embellished cocoon canvas boasts a muted colour palette that will complement other delicate hues but the silver metallic details and the beading will also add an air of opulence. Follow our expert tips to create a dining room that is brimming with elegance.